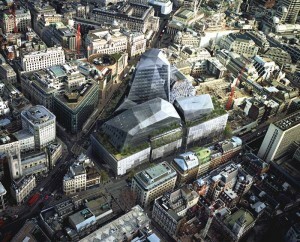 Bloomberg To Get New London HQ? BethPH Bloomberg To Get New London HQ? Global financial information and media agency Bloomberg have allegedly signed a deal to build a new landmark office on the site of the Bucklersbury House building near the Bank of England. The US company, which is currently situated in Finsbury Square near Moorgate, has outgrown its current space and has been casting around the City for some time to acquire space for a new headquarters. The original scheme for the site was drawn up by architects Atelier Foster Nouvel with owners Legal & General and in line with many other new towers in London, given a nickname – Darth Vader’s helmet. Bloomberg have yet to confirm or deny the reports, but a spokesperson suggests that more information will be forthcoming. The new development by Foster & Partners, who include Canary Wharf underground and Crossrail stations and the Millennium Bridge in their portfolio, would replace the under-demolition Bucklersbury House, and potentially include a new entrance to Bank station. The 3.5 acre site will also house the Roman Temple of Mithras which will be reunited with its original location.